Albion's club record signing Jurgen Locadia is targeting his first Premier League start - and arch rivals Crystal Palace - after the international break. The Dutch striker joined for £16m from PSV Eindhoven in January and has so far scored two goals in four appearances. He impressed in the 2-0 FA Cup quarter-final defeat at Manchester United on Saturday and is now pushing for a first league start. Albion have back-to-back home games against Leicester then Huddersfield when they return to action and Locadia said: “I’ve been fit for two weeks now. I’m ready to play, I feel good. We’ve got eight games and I hope to start. “They’re two big games coming up and Crystal Palace as well. I’ve been told about it, that’s a big game too but all of the games are important for us. 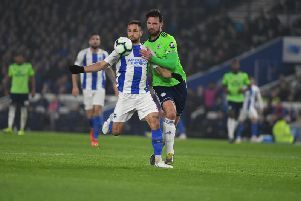 Locadia believes Albion will stay in the Premier League if they continue to perform how they did at Old Trafford on Saturday. He said: "If we play like the way we did against Man United, then we have a good shot to stay in the league.